HOW I GOT THIS BOOK: In one of the trips to the local book shop, the descriptions of the book in its back cover drew me to add this to my collection. Now I have happily passed on the legacy. Danilo Silva is leading a seemingly quiet and calm life in the streets of a Brazil town. A man who has just enough money to get by and a girlfriend to his name, but someone who has crooks following him night and day and spending millions to search and locate him. The book opens with his search and capture. People torture him to reveal his past, because Danilo Silva is actually Patrick Lanigan who was a successful partner of a law firm. His crime? He escaped from his law firm after embezzling ninety million dollars. And he managed to do this by faking his own death. Four years earlier Patrick Lanigan wanted to escape from a bad marriage, scheming partners, and a less than satisfying life. He bid his time and planned to live a life most people only dream of. He spied on his own friends, partners and wife and engineered his escape in a spectacular car crash and a fire. But his past actions catch up, and Patrick is traced, chained and brought back home to USA as a criminal. Once home he hires a lawyer who was a classmate and feeds the information in bits and pieces to him, via his Brazilian girlfriend Eva Miranda. Even after all that he has done, Patrick hopes to escape because he knows what others do not know. The tale of his escape is given in such vivid detail and the book is a masterpiece in the legal thrillers genre. John Grisham proves that he is a master of twists in the few final pages of the novel, because whatever Patrick has, he can never get the one thing he thought he could have in his life. WHAT I LIKED: Plot, scenes, characters. VERDICT: A bittersweet legal saga. John Ray Grisham, Jr. (born February 8, 1955) is an American lawyer, politician, and author, best known for his popular legal thrillers. John Grisham graduated from Mississippi State University before attending the University Of Mississippi School Of Law in 1981 and practiced criminal law for about a decade. He also served in the House of Representatives in Mississippi from January 1984 to September 1990. He began writing his first novel, A Time to Kill, in 1984, and it was published in June 1989. 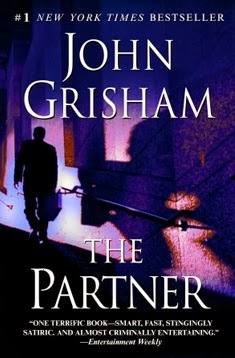 Grisham's first bestseller was The Firm. Released in 1991, it sold more than seven million copies. The book was later adapted into a feature film in 1993, and a TV series in 2012 which "continues the story of attorney Mitchell McDeere and his family 10 years after the events of the film and novel. Eight of his other novels have also been adapted into films: The Chamber, The Client, A Painted House, The Pelican Brief, Skipping Christmas, The Rainmaker, The Runaway Jury, and A Time to Kill. His books have been translated into 29 languages and published worldwide. HOW I GOT THIS BOOK: A recommendation of a friend who passed on this legacy by giving me a handy paperback of this novel and insisted I read it, if not for the genre then at least for the words. Frances Allard, a school teacher spends the Christmas that year in her aunt's house. A contented lady who finds happiness in teaching students, Frances is shown to live a simple life. But the return journey from that house in a rickety carriage and a day spent stranded due to snow gives her memory to last a lifetime. Lucius Marshall, a noble man, finds himself at a predicament when his horse drawn carriage collides with that of a young lady and the weather forces them to share a place at a local inn. Heavy snowfall plays havoc in their travel plans and the two contrasting, unwilling people are put together by a quirk of fate. Both the lead characters find their predicament initially disgusting, then they accept it in a resigned abandon, and finally are undeniably attracted to each other, as was expected in a novel of this genre. But this novel does have its quirky moments like Frances teaching Lucius to peel potatoes and Lucius helping Frances to cart off snow. The book is more about the individual scenes rather than the whole plotline. Much like a typical romance novel, the intimacy between the lead characters builds up slowly; with making snow men and dancing together to finally reach the inevitable. But all this activities that can be given in a dry run are described in a way that will engross even those readers who are not fans of this genre. The story takes an ugly turn when reality bites and noble man Lucius declares that she must leave her job and come to live with him, without a real marriage proposal. This irks the self respect of the lady and she refuses to accompany him on his harebrained plan. They go their separate ways and neither finds life the same again. Though filled with other people and their own responsibilities, the couple could not forget each other. A twist in the story brings them closer together geographically and the couple decide they are made for each other if fate is pushing them so close. Finally, it is left to Lucius to come back in search of his beloved and win her hand legally in marriage. The usual light reads and poignant moments fill the book. If asked to write a gist of the story that filled the book, it would not even fill a few lines. But the author differs from others and captivates the reader in her portrayal of scenes, deep characters, and witty lines. At the end of the book, there are a lot of dialogues and scenes worthy of retelling and the story itself becomes unforgettable. WHAT I LIKED: Powerful scenes, excellent dialogs, relatable concepts. VERDICT: Credits to be given to the author for making a simple plotline 'simply unforgettable'. Mary Balogh (rhymes with Kellogg, born Mary Jenkins on 24 March 1944 in Swansea, Wales) is a Welsh-Canadian historical romance novelist. Mary Jenkins was born and raised in Swansea, Wales, daughter of Mildred "Double", a homemaker, and Arthur Jenkins, a sign writer and painter. She moved to Canada on a two-year teaching contract in 1967 after leaving university. There, she met and married her Canadian husband Robert Balogh, a coroner and ambulance driver, and settled in the small prairie town of Kipling, Saskatchewan, Canada. She taught high school English for a number of years, and rose to the level of school principal. She has three children, Jacqueline, Christopher and Sian, and five grandchildren, Matthew, Shianne, Jayden, Cash, and Christo. As an adult, Balogh discovered the world of the historical romance as written by Georgette Heyer. The vast majority of Balogh's novels have been set in Regency or Georgian England or Wales. Although she writes historical romances, Mary Balogh's heroines are often not "ladies". Some are courtesans, illegitimate, "fallen" or "ruined" women. All enjoy passion, and often a marriage and/or a sensual connection precedes recognition of love. Balogh began her writing career in 1983, when she wrote her first novel A Masked Deception in the evenings at the kitchen table while home and family functioned around her. A Masked Deception was accepted by Signet and published in 1985. Mary Balogh won the Romantic Times Award for best new Regency writer that year. She is the author of more than 60 published novels and over 30 novellas and has met with critical success. She has received numerous awards, including a Romantic Times Career Achievement Award for Regency Short Stories in 1993 and has appeared on the New York Times bestseller list. EDITIONS AVAILABLE: Hardcover, Paperback, Audiobook. HOW I GOT THIS BOOK: This book needs no introduction, neither does the author. But the popularity of both led me to get the title in paperback and read this. Harvey Metcalfe, a scheming businessman, has the habit of riding the wave of business from stocks to shares and does not really bother about professional ethics. He soon becomes a millionaire and as is usual creates a new scheme for an oil rig and sells stocks for this phony business and hires people to advertise and market this scam. Four distinguished men fall for the trick and buy stocks of the company in large numbers. How they join hands and get their money back forms the rest of the story. Professor of Mathematics, Stephen, realises that he has been duped by a company and gets details of other such people who have been cheated. Though initially skittish, medical doctor Robin, art dealer Jean, and Earl James agree to form a plan to thwart one of the most criminal minded businessmen. Stephen becomes the brain behind the whole operation and plans ways for each of them to get back the money they had lost. Each of the distinguished men comes up with a plan that involves the other three of them. They play to their strengths and despite many errors and miscalculations and unwilling victim, they manage to get back their rights. Only the Earl is left without a plan though he becomes the heart and soul of the whole operation. Sir Archer places a twist right at the end that gobbles up all other plot twists and proves his mastery over both the profession and the language. The logic errors and plot holes in the story are over shadowed by the sheer brilliance of the whole conceived idea. Yes, there are certain questionable scenes but these will be ignored just because they add more speed to the already racy narrative. And with Sir Archer, there are certain allowances. WHAT I LIKED: Racy plot, riveting scenes, interesting theories. WHAT COULD HAVE BEEN BETTER: Questionable logic and unnecessary degrading of an initially threatening villain. VERDICT: The plot is too good to give this a miss. A must read for fans of this genre. 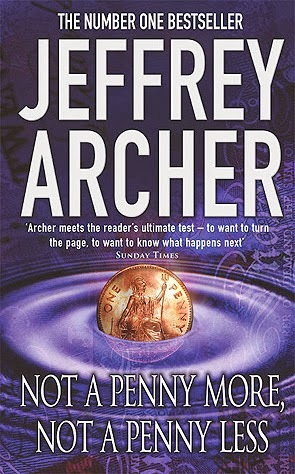 His first book, Not a Penny More, Not a Penny Less, was picked up by the literary agent Deborah Owen and published first in the US, then eventually in Britain in the autumn of 1976. The book was a success and Archer avoided bankruptcy. A BBC Television adaptation of the book was broadcast in 1990, and a radio adaptation was aired on BBC Radio 4 in the early 1980s. Kane and Abel proved to be his best-selling work, reaching number one on The New York Times bestsellers list. It was made into a television mini-series by CBS in 1985, starring Peter Strauss and Sam Neill. The following year, Granada TV screened a ten-part adaptation of another Archer bestseller, First Among Equals, which told the story of four men and their quest to become Prime Minister. In 1979, Archer purchased the Old Vicarage, Grantchester, a house associated with the poet Rupert Brooke. By now Archer was back in a comfortable financial position and began to hold shepherd's pie and Krug parties for prominent people at his London apartment, which overlooks the Houses of Parliament.